The Travelon Anti-Theft Classic Double Zip Crossbody Bag has a slim profile that has a roomy zip compartment, RFID blocking card slots, an open top wall pocket, a zip wall pocket and a tethered key clip with LED light. Two locking zip pockets on the front are perfect for keys, lipstick, tickets and other quick grab items. The rear snap close pocket holds a map, book or sunglasses. Travel securely and confidently with Travelon's Anti-Theft features including slash-resistant construction, locking compartments, slash-resistant and locking straps to keep the bag and its belongings protected. 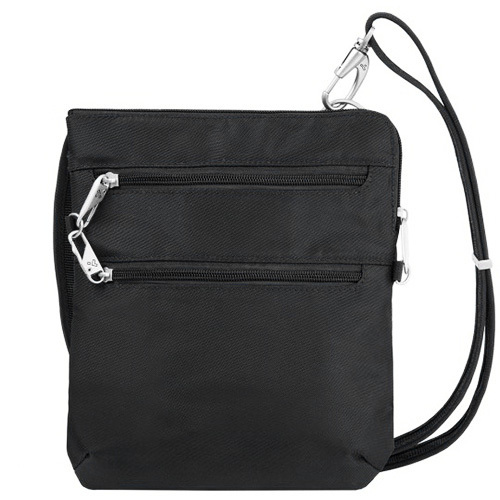 The Travelon Anti-Theft Classic Slim Double Zip Crossbody Bag-Black has many exciting features for users of all types. You can extend the lifetime of your Travelon Anti-Theft Classic Slim Double Zip Crossbody Bag-Black with the purchase of a FactoryOutletStore Factory Protection Plan. See the Travelon Anti-Theft Classic Slim Double Zip Crossbody Bag-Black product video above for more details. 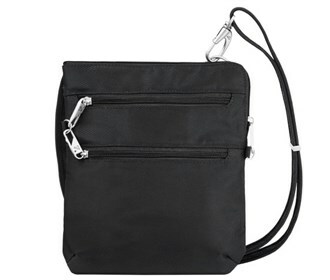 The Travelon Anti-Theft Classic Slim Double Zip Crossbody Bag-Black is sold as a Brand New Unopened Item.